They look the picture of health. And the Lanigan family claim its because they are 100 per cent medicine-free. Antibiotics, painkillers, immunisations and even Calpol are banned by parents Richard and Janette. They even kept one baby out of hospital when doctors told them she was likely to die from whooping cough – and claim the natural nutrients in breast milk kept her alive. Sisters Molly and Isabelle, 14, and Eloise, 11, have never taken part in national immunisation programmes. So they haven’t had jabs for diphtheria, tetanus, whooping cough, polio, haemophilus influenzae, hepatitis B, rotavirus, meningitis B, measles, mumps or rubella. In fact they’ve never even had a Lemsip! And former chiropractor Richard, 61, insists more families should follow their example. “The evidence clearly demonstrates you can strengthen children’s immune systems by letting them play in the dirt and get infections,” he says. “If my kids’ bread dropped on the floor I’d pick it up and put it back in their mouths. “I strengthen my girls’ immune systems by allowing them to get diseases. He adds: “If you look at how we evolved, humans got stronger by getting illnesses. If the girls are in pain at the family home in Thames Ditton, Surrey, the strongest treatment Dad prescribes is ice... or maybe a flat Cola because he believes the acid kills bad tummy bacteria. Richard insists: “I am not anti-drugs. You definitely need them in some cases. And he adds: “If my girls got hit by a bus they’d go to A&E – that’s what emergency medicine is good at. Though daughter Isabelle had chickenpox as a youngster, the first time any of his kids had painkillers was when Eloise hit her head aged seven and went to A&E. Two nurses had to pin her down to give her Calpol because she didn’t know what it was and was so horrified she spat it out. Asked by medical staff if his daughter was allergic to antibiotics, Richard had to admit he had no idea – because she’d never had any. “The nurses were looking at me like a new age freak,” he recalls. 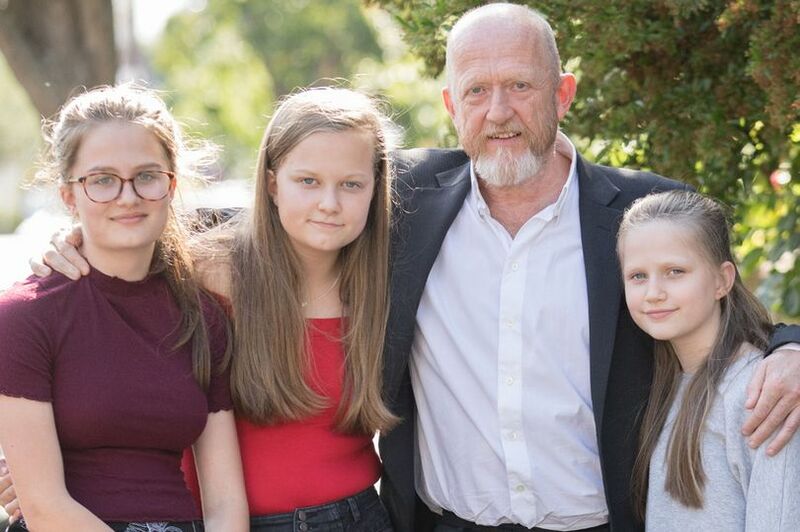 “They couldn’t believe that she had never had antibiotics by that age.” Richard even claims he treated his own rectal cancer with cannabis oil after refusing modern treatments and survived despite being given just months to live. He questioned Britain’s reliance on vaccinations after doing a masters in health promotion in 2004. He says the healthcare system should shift its focus more heavily from immunisation to nutrition and exercise. “Our healthcare system has been taken over by the pharmaceutical industry,” says Richard. “Antibiotics have been used to cure every type of disease, and now we have bacteria that are resistant to them. “What doctors are doing by giving out antibiotics willy-nilly is interrupting an evolving species that has spent millions of years getting healthier. “When it comes to illness it should be down to how that person’s immune system handles it. “If they’re the weakest in the species that may have sad outcomes – but should we compromise the wellbeing of many children for the few who can’t have vaccines? “If you rely on vaccinations and medication for optimal health, you’re creating a weaker species. “Eventually something like the Spanish flu will come along and wipe out millions. The human body evolved as a perfectly self-regulating mechanism to withstand the potentially harmful forces of nature and the environment: physical trauma, famine, toxic exposure and the consequences of infections. Today people lower their immunity by subjecting themselves to incredible stress, and by eating diets more toxic than we have evolved to cope with. Living more in harmony with nature allows the immune system to work optimally, giving us the opportunity to develop natural defences. We should only use medicines such as antibiotics for example (which destroy the gut immune system) as a life-saving last resort. Giving your child medicine really boils down to trusting a doctor’s advice. Doctors don’t give out antibiotics and other things unless we feel they are necessary. If there is a problem and the body’s defence isn’t fighting it, then I would take the doctor’s advice. Not giving vaccines is a big concern. Vaccines work. They prevent illness and potentially even death.